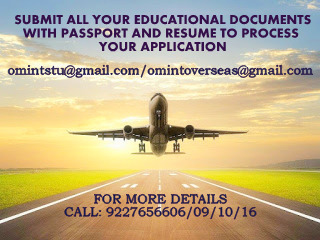 OM VISA Consultancy - Global Immigration, Students, Visitor, Business & Work VISA Consultants: Study abroad in Singapore without IELTS and make your dreams come true with the help of Om International the leading visa consultancy in Gujarat. Study abroad in Singapore without IELTS and make your dreams come true with the help of Om International the leading visa consultancy in Gujarat. Course fees starts from 5500 Singapore Dollars. Labels: SINGAPORE STUDENT VISA, STUDENT VISA, study abroad.